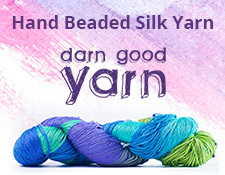 KnitPicks is doing a great charitable promotion right now along with Crafts Americana. Basically, craft something for a charity, upload you wearing said item for charity along with certain hashtags on Instagram (or e-mail the photo), and Crafts Americana will donate $1 to the United Nations Refugee Agency. Neat, huh? Make a different locally and globally! Here’s the original post and instructions from KnitPicks. We’ve all seen the heart-rending images from the Middle East and Europe as of late. We wish we could help, but the massive scale of suffering is so daunting. How does one even start? But what if we joined together? What if we collectively pooled our crafting skills, time and money to help those in need – both locally and across the world? As crocheters and knitters, we are perfect for this mission, because the nature of our craft inherently lends itself to giving. Knit or crochet an item for a local charity of your choice. Post a picture of your item with the hashtags #craft2giveback and #knitpicks and mention your local charity. Take note of the fine print for choosing your local charity. Contact a local homeless shelter, church youth organization, hospital, nursing home or Salvation Army to find local charities in your area. * Campaign runs 10/08/2015 – 11/30/2015. Crafts Americana will donate $1.00 for each photo, up to $5,000, to the United Nations Refugee Agency. Photo entries must contain the hashtag #craft2giveback to be counted. A local charity must be noted to be entered for the $500 prize. Multiple entries allowed, as long as each entry is a different project. Of course, I linked my favorite knitting charity, The Wrap Up, Lancaster Project in my Instagram entry, that’s where these four scarves are going. It’s quite fortuitous that I had them with me to deliver to Angelia after work today when she posted originally about this particular charity. So, start crafting and get going! Snap some photos!